Re-level the dryer – even maybe a slight bias to the front of the dryer. 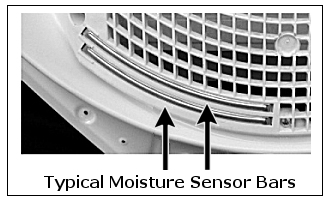 There’s a set of moisture sensing electrodes (metal strips) in the front of the dryer (see article). If your dryer has a backwards bias (tipped backwards), then the wet clothes will not touch the sensor unless there’s enough of them to tumble onto the sensor. Hope that saves someone else some time. PS – If you want to enter a test mode on a Kenmore. This entry was posted by Ben Holt on May 22, 2010 at 9:30 pm, and is filled under Helpdesk, Life. Follow any responses to this post through RSS 2.0. You can leave a response or trackback from your own site.